Seeing the same old blue screen each time you login to Windows XP can get quite boring for you with passing time. 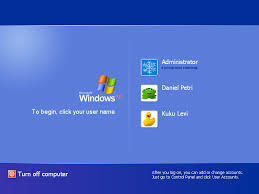 Probably the best way to get rid of this blue screen is to use the direct login feature and not see the welcome screen at all but for multi user computers the welcome screen acts as a login portal and you can not disable it whatsoever. However there is a simple trick to change the welcome screen . How would you Like this One ? before trying to apply this trick. Basically there are two ways to change your login screen. First One is to either replace your default login screen with your new one and the other method is to play with the registry such that it recognizes the new login screen as the default one .. The following steps will guide you how to over write your existing login screen with your new one. 3. Overwrite the existing login screen file with your new login screen and thats it you are done. Second Method that will help Windows identify your new login screen as the default one. The good thing about this trick it that you don’t have to delete or replace your original login screen file. Here it goes. 3. Navigate to HKEY_LOCAL_MACHINE –> SOFTWARE –> Microsoft –> Windows NT –> CurrentVersion –> Winlogon and change the value for UIHost to logonuiA.exe. If you ever feel like restoring your original login screen then all you have to do is use the backup copy of logonui.exe and paste it in C:\windows\system32\ and select over write. You can Find free Login Screens Here.